Experience the game that defines Canada and a sport that has been adopted by over 70 countries. Try your hand at goaltending, shooting, play-by-play calling, and even hosting your own sports broadcast. Revel in the world’s greatest collection of hockey artifacts and get hands-on access to the coveted Stanley Cup. 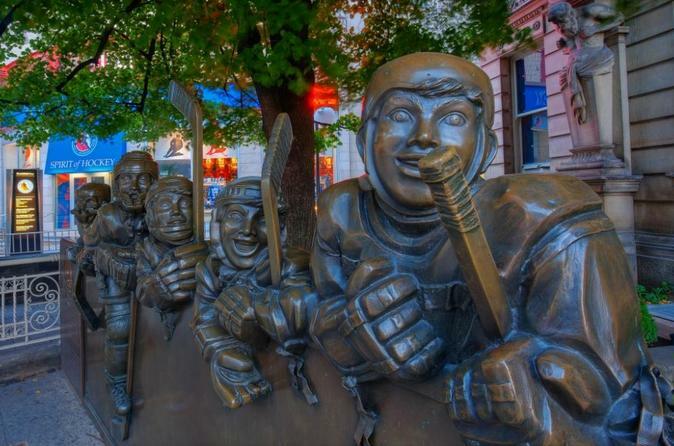 Spread across 65,000 square feet, the Hockey Hall of Fame is a vibrant, immersive and interactive celebration of hockey. Test your goaltending and shooting skills against life-sized, animated versions of today’s top players in a state-of-the-art model rink. Check out the Broadcast Zone where you can call the play-by-play of some of the most memorable moments in hockey history or anchor your own show in a replica studio. Explore themed exhibits dedicated to the game’s greatest players, teams and achievements, a replica NHL dressing room and take in a movie in one of two theatres, including access to hockey’s first 3D film. Get up close and personal with the Stanley Cup. No visit is complete until you’ve had your photo taken with hockey’s Holy Grail! Before you leave, don’t forget to pick up a souvenir from the Spirit of Hockey gift store, featuring an unrivaled selection of hockey-related merchandise and memorabilia.